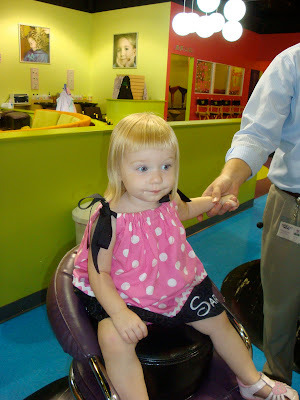 May the Schwartz Be With You: The Schwartz's vs Sarah's "1st Hair Cut"
So we all know this isn't Sarah's 1st hair cut, but it is the first one I've had to pay for. I've been waiting forever for Chris's Mother's Day Massacre to grow out enough to make an appointment with a professional to try to fix it. The more it grew out though, the worse it looked. If I didn't know any better, I would have swore that Chris was sneaking in and cutting it just to tick me off. The more it grew, the more obvious the crookedness of the cut became and also as her hair grew in the back it began to take on a look of Chris's that I don't approve of: the mullet. (Did y'all know Chris had a mullet in high school? I've often told him it was a good thing we didn't meet then. For one reason because I would have been 12 when he was 18 and for another because mullets are gross.) So today, I'd had enough and I made the call. I called Sweet and Sassy, a place that specializes in little girl hair styling. It's more expensive than just taking her to some place like Fantastic Sams but it was well worth it. There was a movie playing at each chair and in this case it was Finding Nemo. Sarah loves Nemo thanks to Grandma Schwartz. It was perfect! She was a little scared when we put her up in the chair so she held daddy's hand and then just zoned out watching the movie letting Heather do her job. I asked her to go ahead and trim the back a little so the short bangs wouldn't make the back look so mullet-like and I swear she must have cut off about 1.5 to 2 inches. It was starting to make me nervous as it does look considerably shorter to me now. But it will grow back out and now at least it's even. The bangs look much better now too! You can't even tell what daddy did those many months ago. Thank goodness! 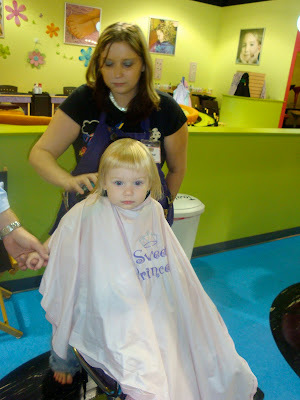 And since we were at Sweet and Sassy after they were done cutting her hair they sprayed some stuff in it to make it smell like cupcakes and spritzed her with glitter. I turned down the lolly pop. Sarah still hasn't had one yet and I don't want to make her aware of them because I don't want to deal with telling her no at all the various places she could be offered one from the Y to the chiropractor. However, we paid for the "baby's 1st hair cut" package so they gave us a lock of Sarah's hair in a little organza pouch, and took a picture of her and gave us a certificate. The finished product. 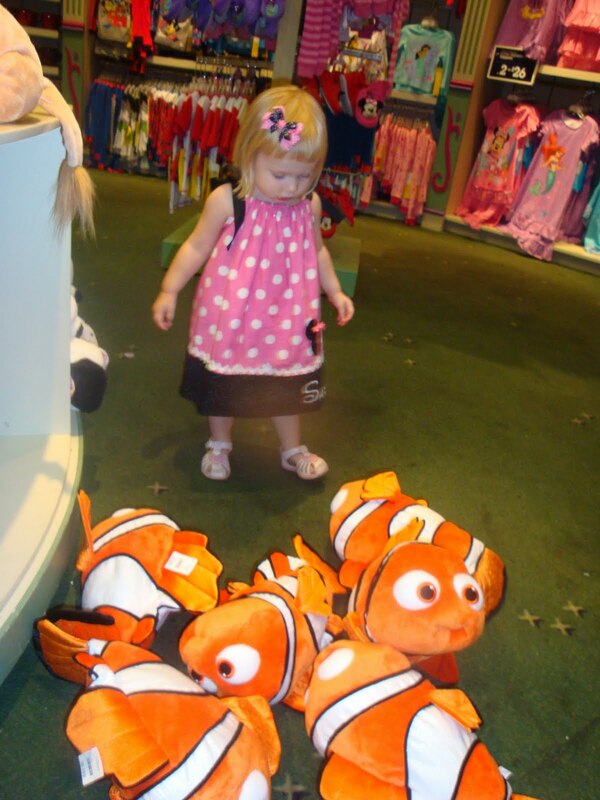 She's still watching Nemo so there was no chance to get her to look at the camera. Poor Heather had a heck of the time trying to get Sarah to look at the camera for the picture for Sarah's certificate. Since Sarah was such a good girl we decided she needed a special treat for this momentous occasion. We took her over to the mall to go to the Disney store to pick out a toy. She took a while and at first it was looking like she was going to pick a lunch box. 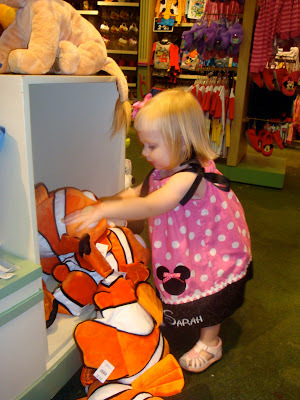 She loves bags and was quite enamored with them, but we eventually made it over to the stuffed animals. 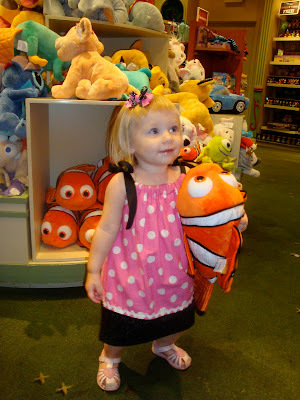 At first she seemed thrilled with 2 small plush dolls--Nemo and Mike Wazowski (I know we said she could have 1 thing, but those 2 cost less than one large plush so it seemed like a deal). 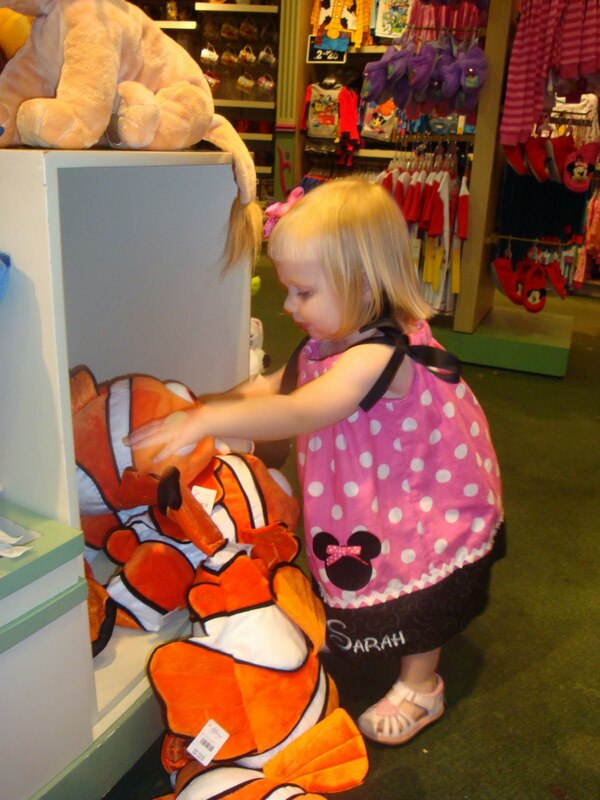 However she soon made her way around the round display that held the large stuffed animals and quickly put the little Nemo and Mike down. And yes, as soon as she picked one she started singing "clean up, clean up" and put the rest of the Nemos back. Celebrating our new hair cut with our new Nemo. Sarah loves her new Nemo. On the way home she was clapping his little belly fins together while singing "if you're happy and you know it clap you hands". When we got home we iChatted Grandma and Grandpa Smith to show them Sarah's new look and she immediately held Nemo up to the camera and announced "Nemo!" And of course, Nemo has earned a place in Sarah's crib for night night time. So it was good day for all: mommy's happy Sarah's hair looks better finally; Sarah's happy she has a giant Nemo to love on; and daddy's happy he finally doesn't have to explain his actions anymore since the traces of his momentary insanity are now gone. 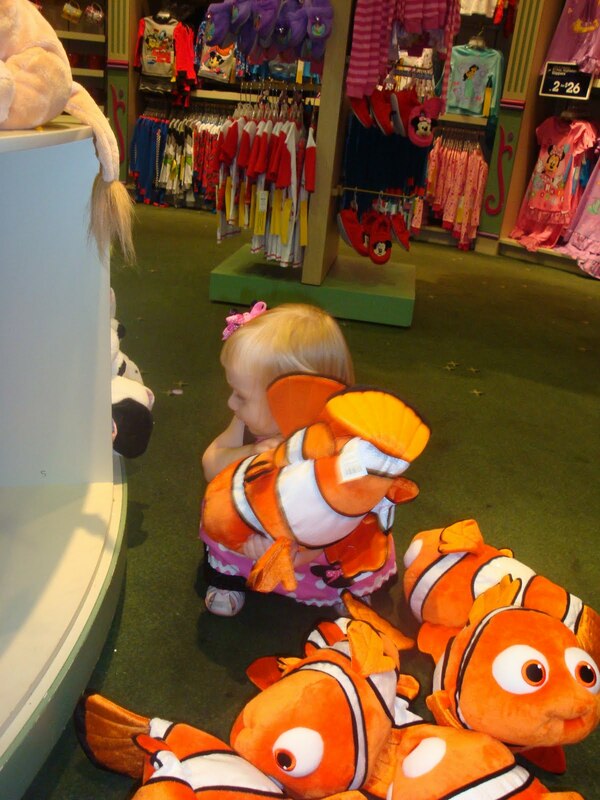 I would have loved to have seen the faces of the Disney Store employees as they watched her pull all those Nemos out. And as she put them back. Adorable!